• Erhverv. 3 landmand i the Altamont Hills just west of Livermore, California. • -. 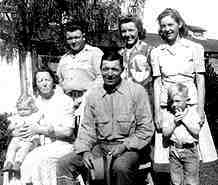 3 Lars (Louie) Madsen was the last of a large flock of children grown up on "Bakkegaard" in Risemark ..Lars Hansen traveled 1/2 year after his confirmation in 1908 with other relatives (Sine & John; Christine & Rasmus), over to his brother and most of them live in Livermore. His wife and a daughter died a few years ago, but another daughter and son still live in Livermore. ..
1 M. Eriksen, Rise Sogns Gårde: fæstere og ejere og deres slægt, 1960, side 140. 2 Rise kirkebog, 1892-1904 opslag 12. 4 Rise kirkebog, 1903-1929 opslag 14.